Fimbul is a good looking little game, set in the viking world of unending cold. You get to play as a berserker returned to life by the gods to prevent Ragnarok, and if that isn't a awesome concept for a game, I don't know what is. There are of course plenty of games out there that base themselves in Norse mythology and lore. It's rarely done with any particular nuance though. 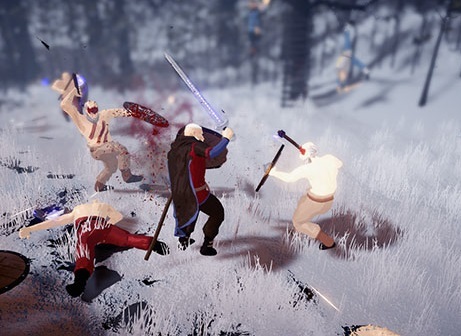 Looking at Fimbul, I've got high hopes that this might just be a game that rises beyond the "it's good fun to hit things with an axe while wearing a pointy helmet" interpretation of Norse history and ancient culture. As per the game summary: Fimbul’s comic book style provides a gorgeous backdrop for players as they forge their own story. The “Lifestring” feature empowers Kveldulver, allowing him to return to earlier points in the story and walk different fated paths. During his adventure, he’ll meet many characters, some of whom are like-minded and willing to support him on his journey. Hidden areas, encounters, and stories provide multiple incentives to see all possible outcomes. The game releases on PlayStation 4 and PC on November 29, with a Switch port due next year. Here's a new trailer to celebrate the release date announcement.